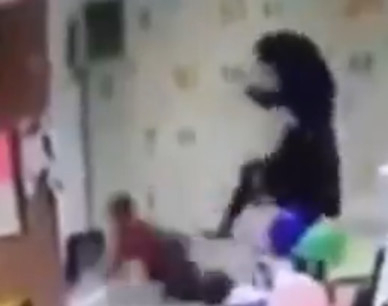 Dubai: A mother and Instagram blogger who focuses on child care issues on her blog was caught on camera brutally kicking her own child in public. The 31-year-old woman, identified as Olga Shvetsova was captured on camera at a shopping mall in Ukraine kicking and slapping her six-year-old boy. According to the Daily Mail, eye witnesses said that she was scolding and shouting out the words, “I hate you”, at the boy. The incident took place at the shopping centre’s play area and the video shows people surrounding and trying to save the child. Two people are seen trying to interrupt the abuse as Shvetsova is pulled away. According to reports, police in Zaporizhia were called but no action was apparently taken. However, once the CCTV footage was released online, the blogger faced backlash from users. On her social media accounts that she has now deleted, she faced criticism from users who were concerned with her actions. The blogger has previously admitted to being exhausted and choosing to take her stress out on her child.